Preheat oven to 350 degrees F. In a large bowl, combine plums, cherries, flour, sugar, cinnamon, ginger, and salt. Stir until fully incorporated and a thick juice forms.In a medium bowl, combine oatmeal, flour, sugars, cinnamon, and salt. Stir until combined and no lumps are present. Drizzle the vegetable oil over the dry ingredients and stir until the oil is mixed throughout the dry ingredients and clumps of various sizes are formed. 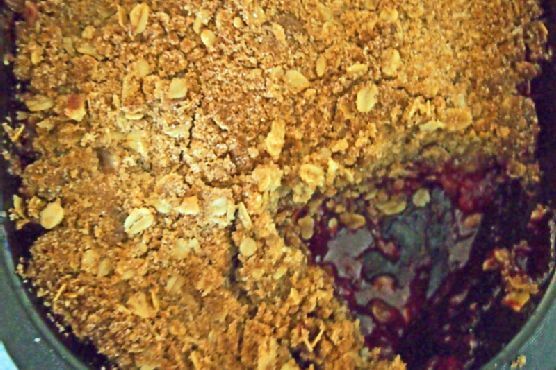 Pour fruit into 1 ½ quart oval baking pan, an 8-inch square pan may alternatively be used. Spread into an even layer. Pour topping over fruit, evening it out with the back of a spoon. Place a piece of foil on the oven rack below the one on which you will bake the crumble in case it bakes over (mine did not). Bake for 45-50 minutes, until the top is slightly brown and the fruit juices are thickened and bubbling. Serve immediately. I do not recommend storing or freezing this recipe; it is best served fresh out of the oven. Cream Sherry, Moscato d'Asti, and Port are my top picks for Crumble. A common wine pairing rule is to make sure your wine is sweeter than your food. Delicate desserts go well with Moscato d'Asti, nutty desserts with cream sherry, and caramel or chocolate desserts pair well with port.